Chinese New Year is a massive celebration that takes place on a different date each year but always early in the year. The date of the New Year depends on the sun and the moon. In 2010 Chinese New Year begins on February 14th. 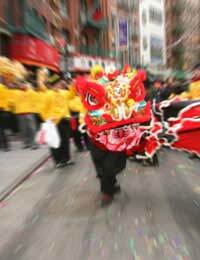 If you want to celebrate in the right way there are various steps to take and things to do – in order to ensure you have a totally authentic Chinese New Year! Just as you may tidy up your house on the run up to Christmas, on the run up to Chinese New Year it is customary to make sure you house is clean and tidy. Make sure everything is shiny and clean in preparation for your celebrations! Yes, cleaning on the run up to Christmas is very important but once the New Year has started you should stop cleaning. Doing any during the start of the New Year is considered bad luck! So make sure your house is looking ship shape on the run up to the celebrations but then put your duster away and enjoy yourself. Like Christmas and most other holidays during Chinese New Year it is customary to hand out greetings cards to friends and family. Most card shops now stock Chinese New Year cards so stock up and give them out to loved ones. Decorating the house is a big tradition of Chinese New Year. Flowers, lights and Chinese scrolls will all help to make the house look festive and pretty in time for the celebrations. On Chinese New Year’s Eve it is customary to get all the family together for a big dinner. Try some Chinese specialities and favourite dishes. Chicken, sauces, noodles, rice and seafood are all commonly eaten. After your meal you should all stay up together to see in the New Year, just like you do on New Year’s Eve. Families should play games together and chat and laugh about the year gone by in preparation for the year ahead. On Chinese New Year’s Day the Chinese give their children red envelopes with money in them. These are a sign of good fortune. You only have to put a little money in each but make sure the envelopes are red. You can give your children these straight after midnight or leave them in their bedrooms for them to wake up to on Chinese New Year’s Day! On New Year’s Day get the family together again for drinks and food and to make plans for the year ahead. Chinese New Year is a time for hope and new beginnings. Chinese New Year is a great, fun celebration that all the family can join in. It can be just as much fun as Christmas but less stressful! Celebrating Chinese New Year is also a great way to teach your children about other cultures and other parts of the world. If you'd like to know more about how other nations celebrate christmas, check out our Around the World section.